One week from today - another yearly affirmation of the trend towards sustainability. So what color best signifies Earth Day? Well, as previously mentioned, there will be a severe shift in the environmental movement away from the color green - as it is has become a cliche. I still don't buy it - but as April 22nd nears, let's look at another color - blue, as a way of celebrating this ever-growing sustainability phenomenon. "Want to stop global warming? Wear BLUE for Earth Day 2008! 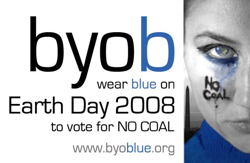 Join millions of people around the world who will be wearing BLUE to signify their vote for NO COAL." I'm more of an Earth Day, Every Day guy personally - as one-day events typically make for good media and little change. Really, much like St. Patricks day, what's the worst thing to happen if you show up to works sans blue - maybe a pinch or some good-natured chiding from your eco-friends... ? 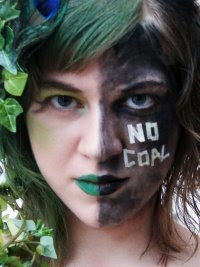 But it is a chance to do something to reaffirm our connection to the environment. Even if you work daily in service of ecology - it's good to step outside the daily routine and take on a different challenge. In this regard, our firm is doing a group Ivy-pulling at Tryon Creek State Park for EarthDay next week - and we're excited about sunshine (hopefully) and a chance to get our hands dirty and do something good that doesn't require sitting behind a desk or staring at a computer. And besides, English Ivy is rampant in natural areas throughout the Pacific Northwest - so every little bit counts. So, I say who cares what you wear (solidarity aside)... it's what you do. I will probably wear green... cliches be damned.